Despite tremendous efforts from OECD/G20 to keep the domestication of BEPS outcomes as smoothly as possible, the current international tax scenario is a rough, somehow agitated transition aimed at reaching a much more inter-nation equitable system where, progressively and within a more or less foreseeable future, the national tax base is expected to be better protected against erosion and profit-shifting manipulations, as well as engrossed by a share of a greater world income basis resulting from the BEPS process’ final grasp on previously nontaxable income. The international tax system is not yet stable  and particularly in the area of stateless income manifestations to share from (e.g., digital economy yields) –absent a conclusive guidance within the income tax coming from the 2015 Report on Action 1– countries show themselves eager to grasp additional income fiercely competing with each other, through the use of innovative tax tools (special levies), and without regard to the potential devastating effects these new tools may have on the digital economy flows and yields caused by cascade taxation. Reasons to resort to special (no income) levies are various, including (i) an apparent OECD/G20 blessing coming from the optionality contemplated in the outcome of the 2015 Report on Action 1, (ii) collection’s easiness; (iii) the need to prevent collision with obligations undertaken under tax treaties, and (iv) the central economies’ failure to assume themselves as market jurisdictions, a condition which for the first time in almost a century align them with emerging (source) economies. In this scenario, instead of recognizing income tax jurisdiction to market countries generally, either through a digital PE or another concept dissociated from the bricks & mortar economy, and even assuming the risk of altering the current jurisdictional balance between residence and source countries, central economies (particularly EU countries) have been inclined to adopt a somehow schizophrenic behavior –against their own long-term interest in the digitized era– consisting of proposing or adopting special no-income levies that leave the income tax inter-nation balance apparently unaffected. The OECD-G20 Final Report on BEPS Action 1 (Addressing the Tax Challenges of the digital Economy) issued in October 2015, illustrates the direct tax challenges posed by the digital economy to market jurisdictions as well as the extremely narrow scope of the traditional PE concept as a tool to allocate income obtained therefrom to destination countries. As a result, the 2015 OECD-G20 BEPS Report’s response to the digital era’s issues fell short to be a satisfactory approach and lacked a uniform recommendation to be implemented by market economies, somehow allowing inter-nation imbalances to rise. Approaches for a comprehensive response were indeed highlighted in Chapter 7 of the Final Report on Action 1 (i.e., the significant economic presence test, a withholding tax on digital transactions, and an equalization levy) but none was adopted nor uniformly recommended. Moreover, the main features of the three options were foremost meagerly described, so that application at the national levels remained subject to wide legislative discretion. Since the work on the digital economy was conceived as an on-going project, the 2015 Report contemplated a revision of the outcome by 2020. The significant economic presence test would have created a taxable presence at the market jurisdiction on the basis of factors that evidence a purposeful and sustained interaction with the economy of that country via technology and other automated tools, such as a local domain name and a local Website or digital platform, availability of a local payment option; or even user-based factors, including monthly active users (MAU) in the country, the regular conclusion of on-line contracts with resident users, and the volume of digital content collected from resident users and customers. The 2015 Report also recommended that the digital and user-based factors (to be chosen in accordance with the features and characteristics of the particular market) be also combined with a revenue factor, i.e., revenues obtained from remote transactions into the country in excess of a revenue threshold, in order to ensure that only cases of significant economic presence are covered. An option contemplated in the 2015 Report was a standalone gross-basis final withholding tax on digital transactions, i.e., payments to nonresident providers of goods and services ordered online (digital sales transactions), under certain specific conditions. In this case, the definition of the transactions covered, as well as the definition of the local collecting agent [e.g., the customer (for B2B or B2G transactions) or a third-party payment processing intermediary (for B2C transactions)] are crucial design element to be considered. This alternative raises a number of questions, including, inter alia, the following: (i) direct taxation of foreign internet sales and services might be deemed to lack sufficient nexus with the taxing jurisdiction, unless a significant economic presence is detected, (ii) the market jurisdiction may consider income derived by foreigners from traditional foreign sales of tangible goods and/or foreign services into the country to be foreign source, in which case taxation of foreign online sales and services would be incoherent from a policy perspective with the treatment afforded to traditional inbound sale and service income; and (iii) a withholding tax on digital transactions from abroad collide with treaty law commitments (particularly the treatment of business income). Based on the foregoing, The UK Diverged Profit Tax (DPT) was designed as a levy which is applied separately from the income tax, and, hence, aimed at bypassing challenges coming from the fact that income tax treaty rules would still treat income from inbound sales and services as foreign source (as well as EU law –applicable at the time of its inception– and trade obligations). Moreover, as conceived, DPT might not be credited against income tax in the taxpayer’s residence country. As from its inception, the UK DPT standalone gross-basis final withholding tax on digital transactions raised serious doubts on its international legitimacy: Is it enough to change the nomen iuris of a tax and resort to a fictional source rule (a SAAR or deemed PE) to go beyond business income jurisdictional principles under tax treaty law? Is the concept of international tax jurisdiction on business income extendable beyond the traditional carved-in-stone PE paradigm, which has remained untouched even after BEPS 2015 Reports? In my view, the UK DPT was a manifest evidence that the 2015 BEPS’ outcome on the taxation of the digital economy fell short to address the inherent international tax issues, and did so due to the lack of consensus within G20 to go a step ahead by adopting the concept of digital PE, probably based on the central economies’ fear to lose revenues from business income by conceding additional taxing powers to market jurisdictions. The third and final alternative presented by the 2015 Report on BEPS Action 1 was the creation of an equalization levy, either under the form of an excise tax applied if and when it is determined the existence of a significant economic presence, or on all remote sales transactions entered into with customers in a market jurisdiction. An example of this tool is the Indian 6% equalization tax that came into effect on June 1st, 2016; as in the case of DPT the tax was conceived as a levy separate from the income tax, applicable on every consideration received by non-residents from Indian tax residents for the provision of online advertisement, digital advertising space, or other similar online advertisement services. The levy is to be withheld by the Indian residents from the consideration paid to nonresident service providers. Aside from the fact that the equalization levy, by its own nature, does not allow the crediting against income tax at the nonresident´s home country (a common issue to withholding taxes designed as separate levies such as the UK DPT), a much more fundamental jurisdictional issue tainted this levy and made it highly controversial: It is a well settled principle that international income tax jurisdiction may not be asserted on a legal fiction; and that is precisely how this levy functions when advertising expenses incurred by Indian residents are deemed a succedaneums of an actual activity in India by the nonresident recipient of the payments. In this context, the query is, once more, whether just by changing the nomen iuris of the tax, a levy is able to overcome an ultra vires taint under general and treaty international tax law. As in the case of the UK DPT, I frankly doubt these levies can be legitimated under international jurisdictional principles. From a different perspective, and assuming that, hypothetically, the equalization levy might be kept afloat after passing an income-type jurisdictional scrutiny, it may be easily envisioned the aggregate over-taxation that would result from the simultaneous application of similar levies by market jurisdictions, as well as the overlap with VAT on the importation of services. 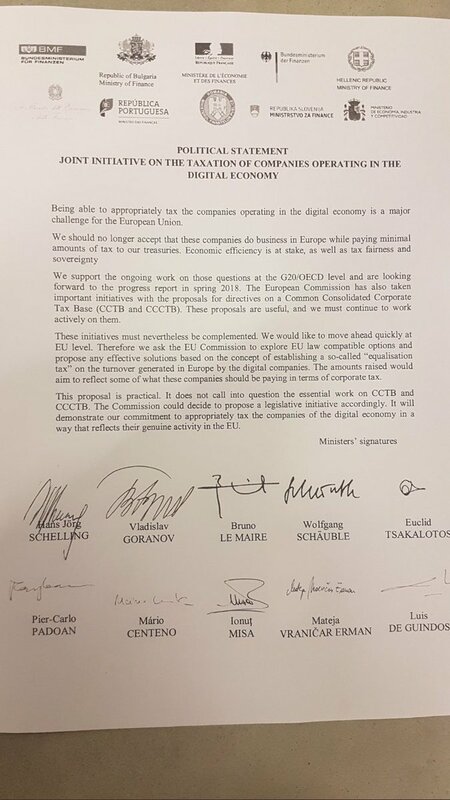 Notwithstanding the above mentioned challenges against special levies on digital economy income, and no matter how damaging even interim solutions outside the income tax might be, a recent pronouncement signed by 10 Finance ministers within the EU insists on an equalization tax on the turnover generated in Europe by the digital companies. Reportedly, however, the proposal did not reached consensus at the digital summit in Tallinn, last September 29, 2017. Meanwhile, the OECD intends to regain control on the digital taxation area by speeding up the revision process expected by 2020. To that end, the Task Force on the Digital Economy (TFDE) is currently seeking public comments on key issues identified in a request for inputs related to the tax challenges raised by digitization and the potential options to address these challenges, which will be subsequently followed by a public consultation meeting to be held at the University of California, Berkeley on November 1st, 2017, and by a revised (interim) report due by April 2018. Although Section D of the request for inputs does not allow to anticipate whether TFDE favors a substantial economic presence or digital PE approach over other controversial tax tools already experimented in practice, it would be highly desirable that it happens after receiving fresh inputs from relevant stakeholders. Options outside the income tax are profoundly damaging and should be at some point discarded as possible options. Besides, hard work is still needed to precisely delineate the concept of substantial economic presence and complementary income attribution rules. Until the taxation of the digital economy is reassessed, something that apparently will not happen definitively within OECD/G20 until 2020, national conflicting experiments will be repeated once and again, without a meaningful, solid, and uniform conceptual basis, and, consequently, with grave consequences to the industry in terms of multiple layers of taxation. Moreover, with the present lack of definition, the anarchic and massive irruption of emerging economies (eager to grasp additional income from digital businesses) will surely end up in a tax chaos of unilateral diverging measures and countermeasures, highly damaging to digital players, flows and yields, consumers, and tax administrations that embark in a harmful tax competition. Based on the foregoing, and while TFDE focuses on precisely developing the substantial presence test and income attribution provisions, it would be highly desirable that G20 countries reach the commitment to maintain the statu quo and not to advance with digital economy unilateral taxation experiments until the revision is terminated, a new workable outcome within the income tax is then released, and offered to participant countries as a minimum standard to be committed with upon MLI ratification. In an article published in 2015, I alerted on the instability of the current world tax scenario, based on a number of different but confluent circumstances including, inter alia, potential inter-country tax imbalances coming from a perceived intention of governments to grasp as much income from border-less activities as possible –such as the various manifestations on the digital economy– whether at residence or at the customers’ jurisdictions (accord., Teijeiro, Opening the Pandora’s Box in the International Tax Field (First Part), Tax Planning International Review, volume 42, #4 April 2015, p. 4 ss). See also, tax Sovereignty in the BEPS Era, Rocha-Christians eds., Wolters Kluwer, Series in International Taxation 60, 2017; Chapter 6, Teijeiro, Jurisdictional Excesses in BEPS Times: National Appropriation of an Enhanced Global Tax basis. Back in 2015, and pending the appearance of the final Reports, I had also observed that should the BEPS Project failed at the end to impose uniform principles on the taxation of the digital economy, chances were certain that countries would attempt to stretch source rules and business presence tests beyond the application of the traditional PE concept, or even depart completely from it to try alternative paths for taxation such as formulary apportionment or destination-based corporate tax, just to mention a couple of them. (Accord. Teijeiro, id. note 1, (Third Part), Tax Planning International Review, volume 42, #6, June 2015, at p. 9-10). Following the release of the Final Report on Action 1, in October 2015, my fears on unilateral and uncoordinated country responses that might lead to a jungle of jurisdictional overlaps and cascade taxation in the digital economy area deepened. Absent the typical PE physical presence requirement, the test is more close to Anglo-Saxon standards such as trade or business or doing business in (as opposed to doing business with) utilized by the US and UK domestic tax systems, respectively. Since the determination of whether an activity is a trade or business for US tax purposes is made on a case-by-case basis, substantial litigation has existed on that determination, as well as on the location of the trade or business and the concept of effectively connected income. For the sake of certainty, more precise contours of the substantial economic presence test should be expected from OECD Task Force on Digital Economy. On DPT see, inter alia, Baker, Diverted profits Tax: A partial response, British Tax Review, 2015-2, p. 167-171; Neidle, The diverted profits tax: flawed by design, British Tax Review, 2015-2, 147-166; Self, The UK’s New Diverted Profits Tax: Compliance with EU Law, Intertax, 43, 4, p. 333-336 (2015). See also, https://www.gov.uk/government/publications/diverted-profits-tax-guidance. Parekh and Wagh, International tax proposals in Budget 2016 – India’s ‘Digital Tax’ googly!, The Tax Booster; Teijeiro, Detecting clouds before the Post-BEPS storm becomes uncontrolled, Kluwer International Tax Blog, March 30, 2016; Gupta, Equalisation Levy is not so equal, August 13, 2016 Https://www.linkedIn.com/pulse/equalisation-levy-so-equal-ca-rohit-gupta-; Wagh, The Taxation of Digital Transactions in India: The New Equalization Levy, IBFD Bulletin for International Taxation, September 2017, p. 538. This principle was clearly stated by the Indian Supreme Court in re Vodafone, January 20, 2012. The Report of the Committee on Taxation of E-Commerce (dated on February 2016, and prepared by the Committee on Taxation of E-Commerce formed by the Central Board of Direct Taxes, Department of Revenue, Ministry of Finance, Government of India), found no possible challenges on this basis. Sara White, CCH Daily, September 18, 2017. See the declaration at https://pbs.twimg.com/media/DJ1-xTsXUAA4QSR.jpg Supporters include France, Spain, Italy, Germany, Austria, Bulgaria, Greece, Portugal, Romania, and Slovenia.